Armed with a notebook, pen and digital recorder, my husband Keith and I joined a group of six like-minded individuals at Heathrow airport, and as we boarded our British airways flight to Bangalore, we left behind a cold grey February in England. 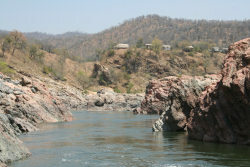 We were on the first leg of our trip to Bush Betta Camp, Mekhedaatu-Sangam, Cauvery Sanctuary, in Karnataka, Southern India, to fish for the magnificent Mahseer. A trusted friend had organised the trip, and I had no expectations, but as we left the relatively cool confines of Bangalore airport, the heat (an energy-sapping 40 degrees C.) and noise hit me full in the face. From that moment, I was awash with the sights and sounds of a rapidly-developing city, and I fell head over heels in love. 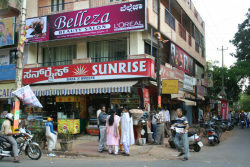 Bangalore is the capital of the Indian state of Karnataka, and its third most-populous city. The mud fort founded in 900 CE by Kempa Gowda the First has grown dramatically in size and sophistication. It's still developing. Known as 'Silicon Valley' for its software companies, it is also home to engineering, manufacturing, aerospace, telecoms, and defence establishments. 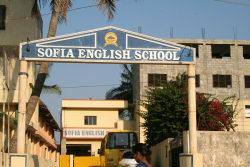 It is a city of enterprise, which also boasts the second-highest literacy rate of the nation. All of this makes Bangalore seem like a commerical hub, which it is, but it also has the reputation for being 'the garden city of India,' because of its parks and lush greenery. A visit to Lal Bagh Glass House (modelled on London's Crystal Palace) and its 240 acre gardens, is a delight to the senses. Commissioned in 1760 by Hyder Ali, it houses an impressive array of rare plants, and some trees are over 100 years old. This oasis in the midst of the hustle and bustle of city life is also a venue for the arts. On the second and fourth weekend of every month, the Government of Karnataka organises 'Janapada Jaatre,' a celebration of traditional dance, folk-lore, and music for anyone who wants a real taste of India. 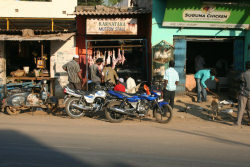 And talking of taste, food is multi-cultural, from traditional Udupi vegetarian cuisine, through to Chinese and Western food - this amazing city has it all; but it's that tangible heart-stopping vibrancy of city life which almost overwhelms the novice traveller, and makes Bangalore such a fascinating destination. There is so much to explore, and learn about a city where new building developments are a testament to the still-growing economy, but one with its origins deeply-rooted in ancient culture. It's a city on the move, and speaking of which, visitors can travel around by hire car, buses, or trains, but the most easily recognisable mode of transport is the extensive fleet of 'autos' - the iconic three-wheeled, black and yellow motorised rickshaws which hurtle around the busy roads. Metred, and accommodating up to three passengers, it's not an experience for the faint-hearted, as there appear to be no laws when driving in this part of India. Drive towards each other at speed, sound your horn, and then swerve! That appears to be the rule of thumb, and yet, not once did I witness an accident. Bangalore is a city where sacred cows wander lethargically, with no apparent sense of direction; and women in vividly-coloured saris sweep the pavements, whilst turning a blind eye to the litter from which the cows feed, and the poorest people scavenge. Sadly the Indian Government has not yet got to grips with the disposal of rubbish which blights the roads from the city, but one's attention is quickly distracted by the other sights and sounds which greet the inquisitive traveller. 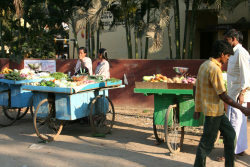 Bustling market stalls line the roads, with row upon row of locally-grown vegetables, all neatly arranged with great pride by the smiling vendors. I just wanted to stroll amongst the people, talk to them, taste their produce, and drink in the sights and sounds of everyday life. Sharply contrasting with the heat and frantic activity of people whose lives depend on making a living, is the rich coolness of the marble-pillared Hotels. They, in turn, highlight the modest simplicity of the homes and businesses of local people; but most noticeable, was the number of smiling faces I saw wherever I went; it was a joy. My transient visit to the city was breathtakingly-memorable, and whilst my final destination was 140 kms. 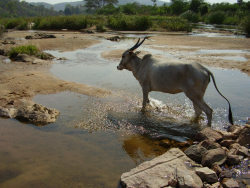 south in the wilds of the Mekhedaatu hills, my love affair with India began in Bangalore, and I can't wait to return to India, and once more, lose myself in its heady embrace.